It’s still sunny here in Grand Junction, but the weatherman says snow is on the way for our valley. 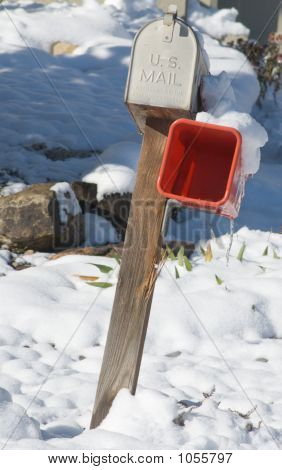 Here’s a photo I took of a mailbox in front of one of the houses in our neighborhood. Looks Christmasy, doesn’t it? I also sold a postcard of my Yellow to Purple abstract acrylic on canvas. I have always admired the quiet prints of Josef Albers. This painting, part of a series of works that move from complement to complement, pays homage to Albers, but takes a different direction. I like to lay my acrylic on thick and loose. I don’t understand this comment. I think it was meant for a different blog.